What Is The True Cost Of An Employee? A quick search on the internet will tell you that the average employee cost is 1.25 times base salary. That’s roughly 25% extra cost for each employee. This is a good rule of thumb for ballpark estimates. expect to pay about $87,000 in the end. As you can see, a simple budget of $70,000 isn’t a realistic view of the true cost of an employee. It’s either a lot more or a little less than what you are budgeting. There are other factors to consider that can increase this cost. Depending on your level of engagement with your employee, your employee cost can soar. 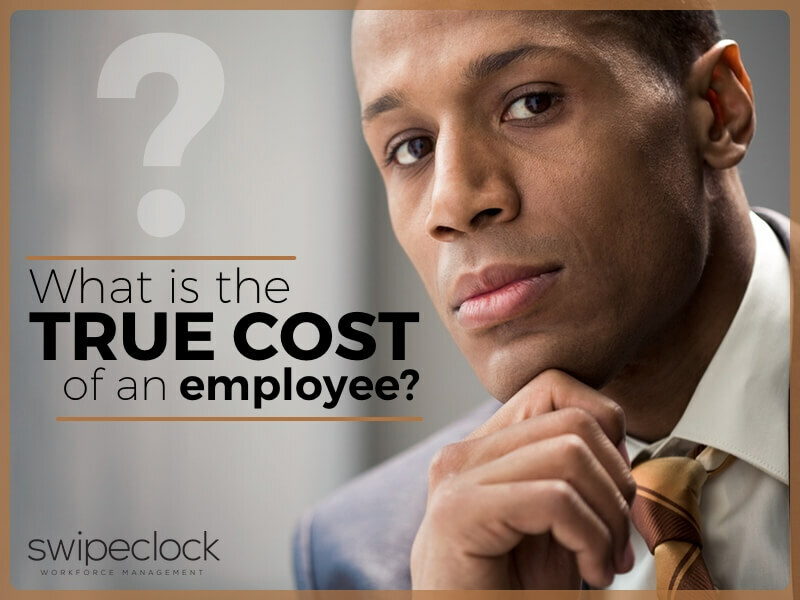 Following are 9 considerations that affect the true cost of an employee in your business. I’ve also included a brief tip to help you address each of these potential problems. My bottom line: use a good time and attendance solution. It will save you a lot of money. The first cost you will incur when hiring an employee is the recruitment cost. I include this one-time cost in my total employee cost calculation as a function of budget. This cost is usually separated by department, but it should be part of your total employee cost. Collecting and maintaining data across many departments can be difficult. The best way to manage this cost is to use historical data to reach an assumption. Work with your assumption and compare to more historic data at regular intervals. Revisit this task often to arrive at a reasonable true cost of an employee at your business. Recruitment costs include any advertising or Want Ads you place. It also includes fees for online recruiting services such as ZipRecruiter. The hard part to calculate is the human time it takes to create accounts, write ads, and manage placement. Labor expenses can be equal or greater than your hard costs. It’s hard to figure, but if you are hiring more than 1-2 employees a month, it makes sense to work it out. Knowing this number will help you budget for long-term growth. Employee recruitment is a hard area in which to save. Best practices include providing incentives to employees for referrals. Referrals are the cheapest way to get new employees. Referral bonuses encourage existing employees to keep their eyes peeled. Referral candidates have one level of vetting before they meet with management. Another way to save is to hire from within the organization. Of course, this will leave a gap somewhere down the line. Hiring from within your organization allows you to leverage experience. It also lowers costs to entry-level employees where recruitment costs are lower. Focus on hiring entry-level employees and moving more experienced ones up the ladder. Recruitment costs per employee are lower for entry-level positions. Payroll wages are the easiest part to calculate employee cost. Overtime can throw your budget out of whack in no time. Payroll wages are straight up: what are you paying the employee? This is an easy cost to predict and is the most stable part of your employee cost. Overtime is another story. If your employee is on a salary basis, this is going to be negligible. If your employee is hourly, this can fluctuate quite a bit. You’ll want to keep an eye on it. Unplanned overtime is one of the great downfalls of business. If you have a large crew on a factory floor, your overtime costs can soar to critical levels. Time and attendance software that helps manage punch in processes is critical. Intelligent clocks that prevent early punching can save a lot of money. Overtime alerts warn you when shift swapping or gap filling are breaking the bank. Warnings prevent accidental approval of overtime and help managers lower costs. Biometric clocks can also reduce buddy punching and other kinds of employee fraud. Every business is subject to time theft, and biometric clocks can reduce the impact. Restricting punch in and punch out times can also reduce employee costs. Employees clocking in five minutes early and late each day can absorb thousands. Prevent unplanned overtime and excessive shift time with lockouts and intelligent clocks. Look at time and attendance scheduling software to reduce unplanned overtime expenses. Employee benefits vary from company to company. They also vary from employee to employee. This is a difficult area to nail down. Complexity, variation, and employee matching options make benefits unique to each employee. Benefits include health insurance, 401k matching and even local entertainment benefits. For example, your company may offer employees a subsidy discount to a local zoo, pool or park. Participation is another factor that can influence the cost per employee. You will find that some, but not all employees take part in entertainment or social benefits. This makes it hard to calculate the true cost of an employee. Benefits are an important part of your recruitment and retention strategy. Scrimp on benefits at your own peril, but work to find a good balance between enough and too much. Work with a good provider to offer a limited group of options for employees. The more you can standardize, the more you can depend on consistent expenses. Use employee self-service solutions to empower employees to manage their own benefits. Saving money on maintenance of your employee benefits is a good way to lower costs. Employee self-service also allows employees to manage their own profiles. They can also take on scheduling functions and other HR related tasks. Employee self-service can reduce the impact on HR and save a lot of interruption time. Time is money, and that’s a great way to lower the true cost of an employee. Historic data in your time and attendance software can help forecasting. Measure employee participation to make more accurate estimates of benefits adoption and usage. Social Security/FICA, Unemployment and Medicare are the taxes to include. Social Security and FICA can account for 6.2% of the first $90,000 you pay your employee. These costs are pretty set and can be forecast with accuracy. Unemployment (FUTA) will run you about 6.2% on the first $7,000 of salary. Besides federal unemployment tax, there may be state unemployment tax for your area. Requirements vary from state to state, so make sure you are in compliance. Medicare will cost about 1.45%. There isn’t a limit on this tax, so remember to consider this ongoing. Don’t forget Workman’s Compensation, which is a variable cost that can run between .3% to 7.5%. The difference will be in the type of employee. Job roles become important when calculating employee payroll taxes. Keeping a good history will help protect you from audit trouble. Archive records will also help in the event an employee files a claim against you. Time and attendance software with job role tracking is a big help. Job role tracking will help you forecast insurance costs. It can even help reduce insurance costs as you plan for new job roles. Historic data will help you forecast, too. Use last year’s expense report to refine your employee cost for future planning. Insurance will be your greatest single expense outside of salary and wages. Research shows that 84% of companies with up to 200 employees offer health insurance. Many companies provide full premium coverage while others offer a limit or percentage. This is an obvious area of customization for your company. Forecasting will depend on employee adoption and individual circumstances. For instance the differences between family and single plans or special conditions. Health insurance is only one aspect of your insurance strategy. You also need to consider the employee cost of on-site accident insurance. Liability insurance, property damage coverage, and specialty insurances can raise employee costs. Your company insurance strategy will be unique. Consider all types and apply a percentage to your calculated employee cost. Insurance is an area where outside help can be a lifesaver. Complicated options and new federal regulations mean this area requires specialization. You’ll do a lot better to see advice from a professional. The true cost of an employee includes employee insurance costs. Empower your employees to take some of the administrative burdens from your managers. Employee self-service can reduce administration expenses, which is a good start to savings. Small businesses rarely offer retirement benefits. If your company does, they are something to consider for the true cost of an employee. Retirement benefits such as pension plans or ongoing service benefits are long-term costs. These costs are part of the true cost of an employee and are difficult to predict. Aging, attrition, and changing financial structures can impact retirement forecasting. This makes it difficult to calculate retirement benefits as an employee cost. Regardless, retirement benefits are part of your true cost of an employee. Historic data will be helpful in planning. Like many other items on our list, retirement benefit warrants professional help. This is a complex area subject to regulation, contracting, and union considerations. You will need help. Time and attendance tracking with historic archiving will be essential. Retirement benefits are often related to work history. Make sure you have a well-documented history with a solid time and attendance app. Performance bonuses are often tied to salary and sales or production objectives. The problem for forecasting these calculations is the variable of the outcome. The true cost of an employee will go up as employees exceed performance goals. The good part is that performance bonuses are often tied to an income-producing activity. So finances tend to work themselves out; the more they make, the more you have to pay employees. Performance bonuses rarely create financial problems because they increase income. Or at least they should. The problem is that this cost is variable, and can increase the true cost of an employee. This makes forecasting employee costs difficult. Make sure your performance bonuses correlate to income producing activities. This is easy for departments where the more an employee produces, the more income you generate. It gets tricky in production-related departments such as a factory floor. Employees making widgets don’t impact sales unless production falls behind demand. I’ll leave the nuance to you more capable managers. Performance bonuses are part of the employee cost calculation. How you arrive at a number for this category has a lot to do with your unique business environment. Performance bonuses should include time and attendance objectives. Use time tracking software to measure employee time and attendance. Review historical data to ensure your employees are meeting goals. Reward according to achievement. Using time tracking software to measure employee performance can help lower employee costs. Time and attendance data can help you correlate productive time to income. Analyze data to make improvements to your performance objectives. Optimizing performance objectives will help lower the true cost of an employee. There is a whole host of expenses that can add to the true cost of an employee. These indirect employee expenses are difficult to quantify and add to the complexity. For instance, office supplies. Each of your employees uses paper, pencils, tools, tables, desks, and chairs. These all contribute to the true cost of an employee. Food is another example of an often forgotten employee expense. Some employers provide break food, lunches, or per-diem meal budgets. These add to the true cost of an employee, too. An ecologic footprint is getting down to the micro level of employee cost, but it is a consideration. The cost of electricity includes computer time, air conditioning, and lighting. You can attribute these costs to a single employee, and measure the cost. Indirect employee expenses are hard to track. The best thing I can recommend is to incorporate an estimate. Make a wild assumption for this area and consider all the items you can think of. Add this to your final calculation. A ballpark figure for indirect employee expenses will be hard to defend. Regardless, including this in your calculation will ensure a more accurate estimate. Finally, we must consider employee theft. I’ve mentioned it a time or two in this article, but it warrants a special mention. The American Payroll Association estimates that theft is affecting 75% of small business. Their focus is on buddy punching and time theft such as early punch in and late punch out. That likely means my business and could include your business. We are all at risk, and this is a factor in employee cost. A survey of employees discovered that employees are stealing about 4.5 hours of time each week. Per employee. I know that sounds absurd, but the numbers appear to be true. Your employees are stealing from you and that affects the true cost of an employee. The best way I have found to confront employee theft is a combination. I use professional time and attendance software. I also use biometric clocks for clock in and clock out. Together, I have a time and attendance solution that helps reduce employee cost. SwipeClock WorkforceHUB is a new workforce management tool that reduces employee cost. It includes scheduling to help you manage employee productivity. WorkforceHUB also includes time and attendance tracking with all the trimmings. Clock restrictions, job roles, journaling; it’s all in there. It also includes document management and payroll integration. To name a few. WorkforceHUB addresses all the problems I have included on my list. It also helps you reduce the true cost of an employee. You paid a lot to get your last employee on board. Use WorkforceHUB to reduce the cost of the next one. You might save enough to justify the costs of upgrading. You will in the long run; that’s for sure.